The Papio-Missouri River NRD Broke ground on Oct 1st, 2015 on Papillion Creek Watershed Dam Site 15A located northwest of 168th and Fort Streets. 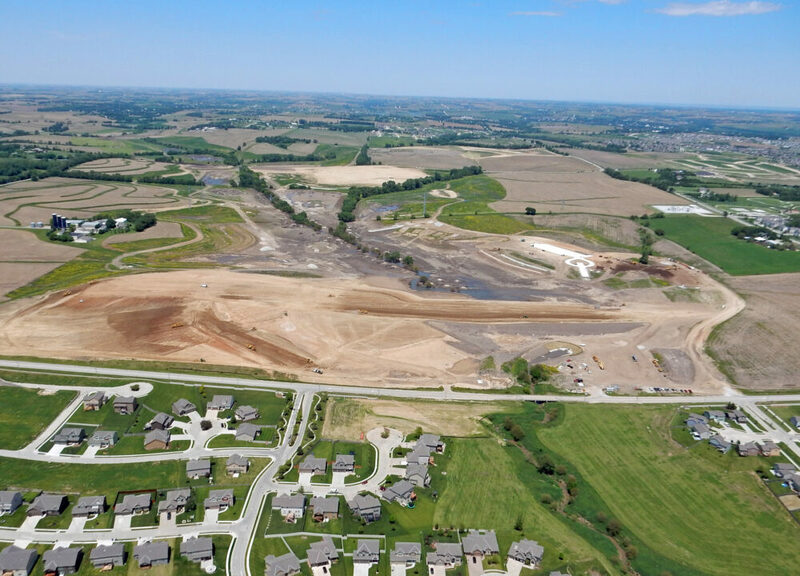 This multi-purpose flood control reservoir and public recreation area will provide significant flood protection to downstream areas along the West Branch Papillion Creek in the Omaha metro area’s 400 square-mile Papillion Creek Watershed. This reservoir is the single largest project undertaken by the Natural Resources District. The reservoir will retain stormwater runoff from an upstream area of approximately 11 square miles. Site 15A will help protect lives and property while offering a 220-acre lake for public water-based recreation. The total parkland area will be approximately 700 acres with hiking/biking trails, boating and fishing, picnicking, and other outdoor recreation and wildlife viewing opportunities for metro area residents. Opening of the recreation area is currently estimated for early 2018. Once completed, the area will be managed for public recreation by the City of Omaha. 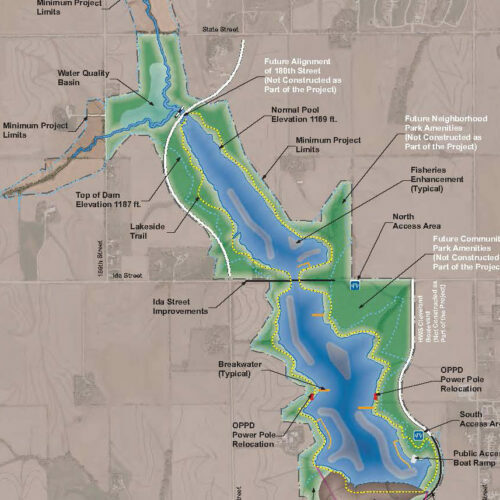 This flood control reservoir and outdoor recreation project is the second to be built under the Papillion Creek Watershed Partnership’s watershed management plan. The first structure, Site WP-5 (now known as Prairie Queen Recreation Area) was built near 126th and Cornhusker Rd. in Sarpy County and is managed for recreation by the City of Papillion. The Partnership, established in 2001, includes representatives from Omaha, Papillion, Bellevue, Gretna, Boys Town, Ralston, LaVista, Sarpy County and the Natural Resources District. The organization has a mission to address issues related to flooding and water quality. Provide recreational benefits to the community. Construction of this reservoir is a result of many years of coordination between the NRD and our Papillion Creek Watershed partners. Real, accomplishable solutions are being put in place to meet water quality and flood control challenges. At the same time, these projects are a boost to our quality of life, the local economy and jobs creation. The District issued $42,600,000 in Flood Protection and Water Quality Enhancement Bonds to fund design, rights-of-way acquisition, and construction of Papio Dam Site 15A. The Nebraska Game and Parks Commission has provided $1,125,000 towards fish habitat creation and boating access. According to General Manager John Winkler “Our goal is to offer sustainable flood protection over the entire Omaha metro area. With interest rates at historic lows, fair land prices and competitive construction costs there isn’t a better time, nor will there ever be, a better time to do this project”.